This week’s edition of the show is just gonna be a train wreck. Inspired by a real train wreck. But besides that, we’re going to go back to school, turn down the lights, hear all about Rosie and do some wondering. There are at least a couple of records making their RRR debut. If you enjoy the show, please let us know by leaving a comment on the website or the Facebook page or sending an email to Glenn@RapidlyRotatingRecords.com. . And remember, your requests and topic segments are always welcome. As always, just click on the link below to instantly listen streaming online and/or download the show. Best wishes for a safe. healthy, happy and exceptionally prosperous New Year. Sweetheart Of My Student Days – Rudy Vallee and His Connecticut Yankees / Rudy Vallee, v.
A New Moon Is Over My Shoulder – Anson Weeks AHO / Fred Williams, v.
I Wonder How I Look When I’m Asleep – Bar Harbor Society Orchestra / Bobby Donlea (Ben Selvin), v.
I Wonder – The Clevelanders / Edmund Ruffner, v.
Don’t Wait Until The Lights Are Low – Henry Thies and His Hotel Sinton Orchestra / Don Dewey & Howard Hafford, v.
When Lights Are Low – Teddy Joyce AHO / Hughie Diamond, v.
Row, Row Rosie – George Olsen and His Music / Billy Murray & Ed Smalle, v.
RRR is also available as a podcast on iTunes. 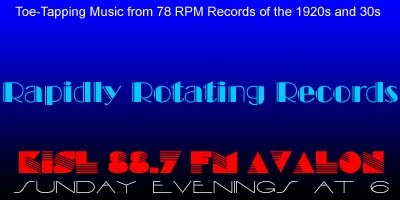 Simply enter Rapidly Rotating Records in the iTunes search box and a link to the show will appear, or go directly via the following link https://itunes.apple.com/us/podcast/rapidly-rotating-records/id1166703514. If you use iTunes, please subscribe to the podcast and leave a rating and comment. THANK YOU! We are proud and happy to announce that Rapidly Rotating Records is now being rebroadcast by Global Community Radio and can be heard over WRST 90.3 Oshkosh, Wisconsin, the broadcast service of the University of Wisconsin. We’re heard on WRST’s internet stream on Saturdays at 8:00 AM (Eastern). We’re also now heard on WXDR, 98.9, in New Orleans, Louisiana. WXDR, known on the air as Dolphin Radio, the student station at Delgado Community College at 7:00 AM (Central).